Fried tacos from the Carrillo Guatemalan vendor. I seem to like Carrillo, don't I? What can I say? There's never a line and the food is good. Squirrels, you'll have to find another flophouse. 149 Kane Street, the infamous wreck of a landmark that was raided two days ago by city officials, is being sealed up like a drum today. And not just the door, which was smashed down by the authorities, but every single window. By the end of the day, every opening will be covered with new plywood. Additionally, workman were handing cinder blocks through the first floor window. I assume this means the plywood with the fortified by a wall of cement, ensuring no more squatters ever find their way inside again. I approached the head workman and asked if I might take a quick look inside. He said there was nothing to see, "just garbage." (I seriously doubted that.) I took a good gander through the wide open window closest to the door, however, and spotted a battered old wardrobe, and a chandelier hanging from a tin ceiling. Hell, I wouldn't be surprised if they found a lost original copy of the Declaration of Independence in there. In my neighborhood, at the intersections where Union and Sackett Streets meet Hicks (both busy thoroughfares that cross over the BQE), construction workers have been ripping up the corners, installing new patches of sidewalk that cut more deeply in the road, thus narrowing the entry and exit points into the crossroads. Earlier I weighed in as not completely hating Guss' Pickles' announced move from the Lower East Side to Brooklyn. I did not know all the fact at this point. Let me adjust my opinion. Why? 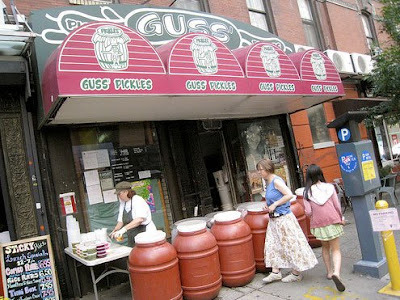 Because, when Guss' Pickles—a landmark for a century—leaves Manhattan, it will be forced by law to leave its name behind. 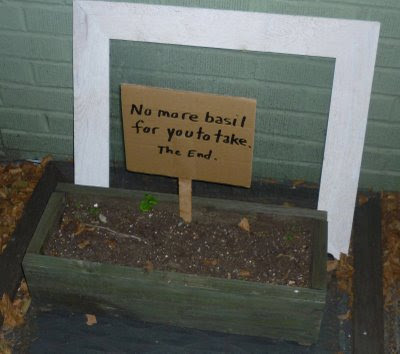 It will became Someone's Pickles, Whoever's Pickles, anything but Guss' Pickles. This is all due to the convoluted and ridiculous lawsuit that has dogged the Guss' legacy for the last few years, in which two parties—Guss' Pickles owner Pat Fairhurst and father and son Steve and Andrew Leibowitz of United Pickles—have both laid claim to the famous name. [Keeping the name] just wouldn't be kosher under a 2007 settlement between Fairhurst and Steve and Andrew Leibowitz, a father and son duo who also laid claim to the Guss' Pickles name. Both pickle peddlers insisted they had the true connection to Isidor Guss, the Polish immigrant who sold pickles from a pushcart in the lower East Side and later opened up the shop. Fairhurst took over the institution from Harold Baker, who had purchased it from Guss' family after the patriarch's death. But the Leibowitzes, who run United Pickle in the Bronx, also had a long relationship with the store and bought the rights to the name. Son Andrew Leibowitz's company, Crossing Delancey Pickle Enterprises, opened a Guss' Pickle shop in Cedarhurst in 2001. Fairhurst sued him in 2006, then Andrew Leibowitz countersued. A 2007 settlement allowed Fairhurst to use the name only at her Orchard St. location. That decision left a bad taste in Fairhurst's mouth, and she has nothing but sour words about it to this day. "We have a following, they don't," she says simply. The Leibowitz's hope the move will bring an end to the sticky pickle predicament at long last. "I wish her all the luck in the world in her new location - as long as she doesn't use our name," said Steve Leibowitz. That such a sweet and simple thing as a timeless Lower East Side pickle dealer should be ruined through greed and litigation is unforgivable. I applaud the Curbed network for openly professing a boycott of United Pickles. I join them. Their claim may be tongue-in-cheek. Mine is serious. I don't know why I would ever go to Cedarhurst, but if I do, I'll spit in the Liebowitz's pickle barrels. The family has brine on its hands. Rat-Squirrel House Excitement: Squatter, Ambulance, Kicked-Down Door! It was the busiest day in the life of the Rat-Squirrel House since Feb. 27, 2008, when the DOB slapped a sidewalk shed and a vacate notice on the sad, dilapidated, falling-down, seriously, ridiculously run-down landmark Cobble Hill red-brick residence. On Wednesday, July 29, the authorities smashed down the old front door of the 1901 building at 149 Kane Street, which has been an eyesore and a menace to neighbors for years now, home to squirrels, pigeons, (maybe rats) and one old woman who would not leave and would not fix the place up. According to reports gathered by Lost City, inside they found a squatter and mounds upon mounds of garbage. Whether the garbage was accumulated by the squatter or by longtime owner Arlene Karlsen—who lived in the crazy, crumbling structure until recently—is unclear. Karlson, who apparently lived around the corner now, in another building she owns (not as badly kept up) was, accordingly to a witness, given the choice of being arrested or taken to the hospital. She left in an ambulance. Sad. A DOB complaint filed that day noted "FAILURE TO MAINTAIN INTERIOR. BLDG OVERLOADED WITH DEBRIS." Past notices have only commented on the exterior. Another complaint, filed July 30, noted that the permit for the sidewalk shed had expired, and that it didn't meet safety code standards. Today, July 30, a van and some workman were on the scene to re-seal the door. They had little information as to future of the four-story building, but speculated that its status as part of the Cobble Hill landmark district would make tearing it down a bit problematic. While I would love to see it restored, I am doubtful that can be accomplished at this point. Tony Avella, whose priorities cause him to make sure he's doing his job as a councilman first before he spends time campaigning for mayor; who turned down an official parking pass because they smack of politics as usual; who thinks New York should be a haven for small businesses, not large developers; and who is still blasting City Council members for overturning term limits? Or Michael Bloomberg, who spends millions and yet manages to lose support; instructs his puppet City Council to kill Coney Island; solves the growing homeless problem by buying indigent families one-way bus tickets; and is so power-mad and anti-Democracy he might already be thinking of a fourth term? Think about your vote this fall. Tonight, at the Waterfront Museum in Red Hook, PortSide's director Carolina Salguero and designer Tim Ventimiglia will talk about plans for Atlantic Basin and the Oil Tanker Mary A. Whalen. They'll recount the history of a 1930's coastal tanker--featured often on this blog-- and "outline their vision for the ship as a platform for educational programming, exhibits and events and for the maritime hub in Atlantic Basin that will be her home. Based in Red Hook where the ship was built, the Mary A. Whalen has been host to a range of innovative programs including the first-ever performance of a live opera in a working container port. 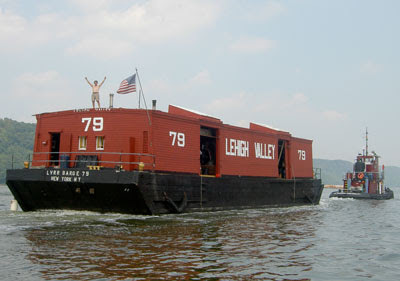 Over the last two years, thirty design students from the Parsons School of Design have been exploring creative ways to transform the ship, re-program its cargo holds and upper deck to interpret a wide range of waterfront themes. For more info see www.waterfrontmuseum.org and www.portsidenewyork.org. Brooklyn Paper reports that the local police have "collared two men last week that they believe are responsible for a spate of bicycle thefts in Cobble Hill and Carroll Gardens this month." Readers of this site will be familiar with the stolen bike problem. Thefts began to rise in late June, and people began carting their bikes inside rather than risk locking it up on the street. But since a cop cuffed the pair between Hoyt and Smith streets, there have been no reported missing penny-farthings, according to a community affairs officer in the precinct. That said, the police have not linked Figueroa and Alcade to any of the earlier crimes. “We’re still investigating it,” said Vincent Marrone, a cop at the the Union Street stationhouse in Carroll Gardens. Good job, 76th! Thanks to Brownstoner, who picked up several of my stories on bike thefts, and Channel 12, who did a subsequent TV segment on the matter. Sam: "Loved to see this sign. My family lived above the store -- before I was born. J. Josephs was my great grandfather. My Uncle and his cousins (my cousins too) ran the store -- and we went there a few times -- and i loved getting lost in the "back." The Josephs family still owns it, as you pointed out." The Luso-American Cultural Center on Henry Street in Brooklyn, near Rapelye, is a steady source of wonderment to me. I've yet to see the inside of what was once St. Paul's Lutheran Church, erected a century and a half ago. However, I recently discovered this beautiful old picture from 1930. Below is the building today. Doesn't look like it's changed much, does it? Just lost its cross. 242 Fifth Avenue near 28th Street is a building that's always interested me, maybe because its easily viewed from the waiting room of my son's doctor's office. So I've spent a lot of time staring at it, wondering about the provenance of a handsome cast iron building so far from SoHo, and why it has been allowed to rust and go vacant for so many years. The other day, as sonny boy was getting a check-up, I noticed that it had been bracketed by a sidewalk shed, and a small army of workers were busy sprucing up the slender, four-story structure. The reason for the scrub job is most likely that the old boy in on the block, as this LoopNet listing testifies: "4 story plus full usable basement with high ceilings, elevator loft retail and office building, 20 feet wide and approx 9000 SF with additional air rights. Delivered 100% vacant, needs complete gut renovation, except for the new roof. Huge ceilings and windows with bright light." This inspired some sleuthing. The building was erected in 1892. Architect, unknown. It was home to the once great hat concern Dobbs & Co. from 1909 to 1914, after which the company moved next door to 244. (I like any building that has a history with hats.) A tailor Rupert Ryley lived and worked there roundabouts 1904. That's about it. The last business resident was C.T. Wan & Co. It's a beautiful structure, a graceful mix of glass and iron. Bet it looks great once they're done cleaning it up. For some years now, there were a couple street signs on Columbia which pointed to streets that no longer existed. Irving Street and Sedgwick Street. The green signs were there, but when you cast your gaze to the west, all you saw were stubby stretches of seeming driveway cut dead by a chain-link fence. Beyond that was a parking lot and a field of weeds. The street were demapped in 1991. I enjoyed those ghost signs. So, apparently, did a reporter at the New York Time, who wrote a lengthy piece about them in 2004. Now, however, they've gone the way of the streets themselves and disappeared. I'm not sure when this happened. There's been a lot of construction on Columbia in recent years. But I suspect it has something to do with the Brooklyn Greenway project. An off-street bike and pedestrian paths on the west side of Columbia Street, that is serving as the Interim Greenway there, recently opened for business. Around the same time, all the old signs has vanished, save one. The Sedgwick Street sign pictured below, on the east side of Columbia, remains. I suspect it was overlooked because the sign is partially obscured from sight by a tree. One of the places where the Irving Street sign once hung, meanwhile, now holds up a birdhouse (above). Irving and Sedgwick were once happening places, if you liked crimes scenes. As the Times article indicated, the two roads, which ran west from Columbia to the docks, were the scene of non-stop factory fires, many of them suspicious, and one in 1862 so notorious (hundreds of Irishmen attacks a few dozen blacks inside a tobacco factory) that it was called The Sedgwick Street Riot by the press. Payroll robberies took place. People fell off the piers and drowned. Illegal liquor was produced. A steamship plowed into Sedgwick pier and smashed it, injuring many. My favorite detail: a floating hotel moored at the end of Sedgwick where two couples were once married on the same night. Aww. This should upset me more than it does. 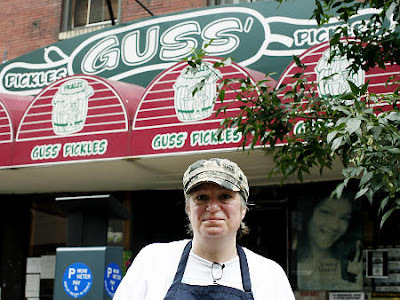 Lo-Down, via Eater, reports that Guss' Pickles, one of the last old-school, Lower East Side institutions, is moving to Brooklyn. The new location is 39th Street between 14th and 15th Avenues, the Kensington neighborhood "in a few months." Patricia says she's running out of room and can't afford rent for a bigger space in the neighborhood since it's changed so much. When the city put a Muni Meter directly in front of her pickle barrels, blocking customers' access, it was the last straw. I'd like Guss' to stay on the LES, where it's always been. But I have to admit that I don't mind the shift. As long as the place stays in business. After all, Guss' has been quite the same Guss' for some time. The business has changed hands a couple times since Izzy Guss retired, most recently to Patricia Fairhurst. And there was the move from the old location on Essex to the newer, less charming one on Orchard. Throw in the whole tangled dispute involving the rights to the Guss name, and you have to wonder aloud: "What difference does a move to Brooklyn make at this point?" It's like hanging a picture with a few cracks in it on a different wall. Besides, a place with a name like Guss' pickles sounds like it belongs in Brooklyn. Cheese Fries. Ice Cream. Cold Beer. Pizza Slice. Sounds like a meal to me. Not in that order, of course. No. 236 President Street is a curious structure, one of the oddest buildings in Carroll Gardens. It's wholly out of keeping with the brick and brownstone dwellings that surround it. Sturdy, four-square, ghostly white with a brooding black cornice (which lists its birthday as 1897) and adorned with various classical architectural touches, it looks a little like a giant mausoleum. It's handsome, but also overbearingly gloomy. For a long time, I assumed it had begun life as some sort of pompous carriage house. Then, last year, I discovered that its grand, four-story, brick neighbor (now an apartment building) has once been the Faculty Home of the Methodist Episcopal Church, owned by the now-gone Simpson Methodist Episcopal Church on the corner of Willoughby and Clermont Avenue. It, too, was erected in 1897, so I thought, perhaps, that the two buildings might be related—even though they look nothing like each other. Then, recently, I found another piece to the puzzle. Passing by one day as the light was hitting the doorway of 236 just right, I noticed a patch of the wall above the front door wasn't as smooth as it ought to have been. I looked closer. Some carved letters seems to have been scraped away from the edifice. On the left one could make out what used to be the word "Christian." On the right, "Memorial." "Christian Memorial." It had been a religious building. Checking with DOB, a 1949 Certificate of Occupancy lists the inside as containing a sanctuary, Chancel, Pastor's Room and classrooms. But it was not a memorial to all Christians, just one specific Christian: Hans S. Christian, a Norwegian immigrant. According to this helpful site, 236 President Street was the Hans S. Christian Memorial Kindergarden, built in honor of a successful lime and brick dealer who was born in Norway in 1825 and moved to Brooklyn. His factory was on the Gowanus Canal at Second Street. He died in 1896. He was for many years president of the board of trustees of the First Place M. E. Church. He actually dropped dead after returning from a Wednesday evening prayer meeting, in a snow storm. He lived at 231 President Street. Amazing what's hiding in plain site if you look hard enough. A shame about those scraped-away letters. For the Avenue that wears its age with grace and not a lot of show, I give the prize to Fifth Avenue in Brooklyn, from Boerum Hill on down through Park Slope to Windsor Terrace. 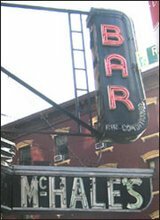 There are very old bars on this strip that do not get a lot of play in the papers—places like O'Connor's, Smith's, Jackie's Fifth Amendment and Smolen Bar & Grill. Likewise, you'll find a lot of retail stores and diners which are quietly marking their decades, such as Eagle Provisions. Here are a couple of long-serving slice joints which sit a few blocks from each other: Luigi's (since 21st), which was founded in 1973; and Lenny's (near 17th), which dates back from the 1950s. You can see what Lenny looked like it you walk on to the back. There's an oil portrait of the man in a suit, complete with boutonniere. actory. Just actory. Used to be one, I guess—a factory, I mean. But producing what? On Fifth Avenue in Brooklyn. Former Blockbuster on Court Street to Become a Grocery Store? On June 5, Brownstoner reported that the property was sold off for $3.7 million to a firm called Broadmill Development, "which recently developed a Chelsea condo called The Carriage House. Eric Gray, one of Broadmill's principals, says the company has "no definitive plans" for the site yet, and it could either be redeveloped or leased to a retailer." Today, I noticed there was scaffolding on half of the structure. The windows were papered over. And there were DOB notices on the doors. Something was definitely up. Trumpet blast! Off to the DOB website! Sure enough, a filing dated July 7 states, quite plaintly, "RENOVATE EXISTING RETAIL STORE FOR USE AS GROCERY STORE." Another on July 14 says, "ERECT A TOTAL OF 30 LINEAR FEET BY 12 FEET APPROXIMATE HIGH HEAVY DUTY SIDEWALK SHED." That could be good. Court Street needs a grocery store—has ever since Key Food became a CVS. Trader Joe's is nice and all, but a more general use food store would be of use. But what grocery store will it be? Brownstoner says Union Market. So, a reporter from Channel 12 saw my recent story about a rash of bike thefts in Carroll Gardens. She contacted me, wanting to do a story, and asked if I could put her in contact with someone who had had their bike stolen recently. I suggested the owners of The Bike Shop as a likely authority, but they apparently didn't want to comment. I reached out and did find someone, but it turned out he was from Park Slope, not Carroll Gardens. They needed someone from Carroll Gardens. I didn't have time to find anyone else—I'm a busy guy, and have my own work to do. 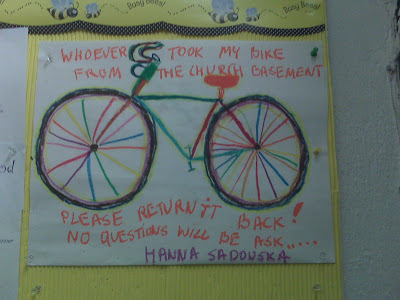 So—ta da!—the story turned into: "Park Slope bike-part thefts on the rise." And that's how the news works. For four years, NICK CARR has been a film location scout in New York City, finding the perfect dark alleys, rooftop getaways and neighborhood bars for Hollywood. Carr, who chronicles his job at ScoutingNY.com, says, "What never ceases to amaze me about New York is how much there is to see if you take the time to look. Every street has a hidden gem or two: remnants of a bygone era, beautiful architectural flourishes, an interesting oddity or quirk. And yet, I find that most of it goes unnoticed by the hundreds, if not thousands, of daily passersby in too much of a hurry to pay attention." Here, Carr shares his 10 favorite finds, "the places that remind you that the city has a lot to offer those who take the time to slow down and appreciate it." It's as if a tornado blew in from Cape Cod and deposited a beach house onto the East Village. Perched on the roof of a four-story brick apartment building is a shingled cottage, complete with bay windows and a weathervane-topped cupola. The owner calls it "Up-Upon-It" (a joking reference to friends with cottages in Sagaponack), and rumors abound that it is surrounded with sand and lawn chairs. Hundreds of years ago, dozens of rivers, brooks and streams dissected the island of Manhattan. All were eventually filled in or diverted underground via manmade canals, the only remnants of their existence left in the names of streets traversing their former locations (Water Street, Spring Street and Canal Street, among others). Incredibly, at least one such stream, the Minetta Brook, continues to flow to this day. Once cutting a path from 21st Street and Sixth Avenue through the West Village into the Hudson River, the brook was driven underground by developers in the early 1800s (the odd angle in Minetta Street allegedly follows its original footprint). A glass fountain in the lobby of 2 Fifth Avenue with pipes reaching down to the Minetta offers a rare glimpse to its continued existence. Check it out after a heavy rainfall to see water barreling up as the brook rages deep below the streets of Manhattan. Measuring in at an astonishing 12-feet-wide, this four-story Midtown oddity can only be described as a brownstone that has been sliced in half. Towering office buildings on either side seem to be squeezing it out, as if desperate for breathing room. With only enough space for a single row of windows running up to the slated mansard roof, the interior is further reduced by a stairwell on one side of the building. As a fellow location scout once mused, "Perhaps this building came first, and everything else was built around it?" With such landmarks as Grand Central Terminal and the MetLife building to steal your gaze, one could be forgiven for not noticing the ornately-decorated bronze clock overhead. 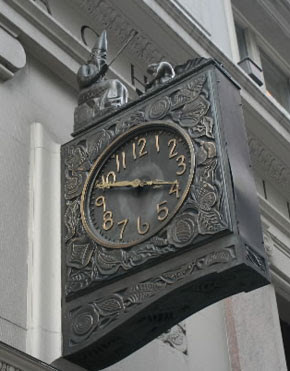 Designed by artist William Zorach and inspired by the building's history in the silk trade, the clock is beautifully decorated in crawling silkworms and lush mulberry leaves (a silkworm's favorite food). However, the marvel here is a bearded wizard perched atop the clock. At the start of every hour, the wizard waves his wand, causing the man kneeling before him to swing a hammer against an anvil, tolling the hour. This awakens the "Queen of Silk," who rises up from a cocoon and remains aloft until the hour has finished striking. Incredibly, the clock is still fully powered by wooden pendulums (though due to the expansion and contraction of the wood, you probably shouldn't set your watch by it). I love finding remnants of a New York that no longer exists. Fading brick-wall advertisements, train tracks to nowhere and stone-carved logos for defunct businesses serve as a reminder of just how hard it is to fully erase the past. One such telling artifact can be found at Park Avenue and 23rd Street. Here, bronze lettering on the southeast corner building identify the adjacent streets, but the Park Avenue side is strangely marked "Fourth Avenue" -- even though Fourth Avenue terminates downtown at 14th Street! In fact, Park Avenue was once entirely known as Fourth Avenue. In the early 1800s, a steam-engine trainline ran the length of it, bringing a sizable amount of filth and pollution to the avenue. The underground tunnel at 38th Street (now a car underpass) was once an old train tunnel, on top of which was planted a landscaped garden. This section became known as Park Avenue, a name that eventually spread in a bid to draw interest back to the heavily polluted area. Once the headquarters for the renowned New York Architectural Terra-Cotta Works (suppliers of terra-cotta for Carnegie Hall, among countless others), the building became vacant after the company went out of business in the 1920s. It acquired landmark status in 1982, after which Citibank -- owners of the property since 1970 -- sealed it up and left it to rot. Recently, Silver Cup Studios announced plans to build a new studio on the lot behind the building, with promises to restore it. However, the plan seems to have stalled, and the little building under the bridge continues to decay. That it still stands despite decades of neglect is a testament to the quality of its construction. Studebaker, one of the first automobile manufacturers in the US, once had a sizable presence in New York, including this former car showroom. Made of white concrete and white terra-cotta, the building is in pristine condition. A recent renovation sadly removed the two-story wrap-around showroom windows on the ground level, but Studebaker emblems, logos and imaginative Gothic flourishes thankfully still adorn the exterior. The building dates back to a time when this area was known as Automobile Row. You'll find remnants from the era around the neighborhood. One of the most beautiful and pleasant places in New York City is the Morningside Heights campus of Columbia University. Built on the site of the former Bloomingdale Insane Asylum (only a single red-brick building, which once housed wealthy men with mental illnesses, remains from this era), the campus covers an astonishing six city blocks without a single active cross street bisecting it. Located in the center of campus is the statue of Alma Mater, sculpted by Daniel Chester French and a symbol for the university. Inspired by Minerva, the goddess of wisdom, Alma Mater's arms are raised invitingly toward the campus as if welcoming in the knowledge around her. But Alma Mater harbors a secret: an owl, hidden in the folds of her robe and completely invisible at a distance. There are a number of legends about the rewards that will come to a student that finds the owl: marry a Barnard girl within the year, become class valedictorian, general good luck, etc. As I would hate to deprive you of any of these potential riches, I will leave you to find Alma Mater's secret owl on your own! One of the most moving public art pieces in New York City is a haunting tribute to commercial sailors who lost their lives at sea. The memorial, designed by artist Marisol, was inspired by a true event during World War II, in which a Nazi U-boat attacked an American merchant marine vessel. While the marines desperately clung to their sinking ship, the Nazis photographed the victims, then left them to the open seas. The memorial is directly based on one of those photographs. In the sculpture, two men are desperately crying for help atop a sinking boat while a third tries to pull a victim from the water. There is an unbelievable sense of desperation and frustration in the piece, as the drowning man struggles, veins bursting from his arm, to grab hold of the seaman above and salvation as the waters of the Hudson mercilessly lap at his head, often completely submerging him. The piece is rendered all the more chilling when one reads the final line of the historical marker: "Left to the perils of the sea, the survivors later perished." Long before it was a TGI Friday's, the building was a showroom for Israel Miller, a famed shoemaker for Broadway shows. A motto from the period still lines the top of the building: "The Show Folks Shoe Shop Dedicated To Beauty In Footwear." But the real highlight here, my favorite hidden gem of Times Square, is the row of four statues positioned high up on the West 46th Street wall, each depicting a famed Broadway actor of the 1920s in costume as their most notable role. A public contest was held to choose the top actors of the day in the categories of drama, comedy, film and opera, resulting in such picks as Ethel Barrymore (Drew's great aunt) for her work as Ophelia. Despite being covered in dirt and grime and completely ignored by millions of tourists, these statues continue to stand proud in front of gold-leafed backgrounds, having attained the rarest of rare: a permanent place in Times Square. Carroll Gardens' Basil War Came to a Bitter End; While Carroll Gardens' Bike War Raged On; the Situation at Chumley's Got Worse; The Former Brothers Bar-B-Cue Continued to Decline; City Council's Land-use Committee Approved The City's Rezoning of Coney Island That Nobody Likes; Bloomberg Polluted the City With His Idling SUV; I Went to La Sevilla. Labels: bloomberg, Carroll Gardens, chumley's, who goes there? Thieves continue to prey on Cobble Hill and Carroll Gardens bikes. This plaintive message was posted on a bulletin inside the landmark Christ Church at Kane and Clinton. If anyone out there has had a bike stolen recently in Cobble Hill or Carroll Gardens, please contact me. Big time TV reporters are interested in your story! Another sign that New York is becoming a bourgeois place unwelcoming to people of more meager means: laundromats are disappearing. This has been happening in my neighborhood for some time. Not The Villager reports it's happening in Greenwich Village where, apparently, everyone now has a washer-dryer. The laundromats that have disappeared in the last few years include Harry Chong’s, at Waverly Place and Charles St., which closed after 60 years in business; the Stinky Sock, on W. Fourth St., and the Charles Street Laundromat. Most recently, Cesmar Laundromat, on 11th St., closed earlier this year. Despite the recession, monthly rents are still high in the West Village, said a small retailer who asked to remain anonymous. He looked around at his business neighbors and pointed across the street at an empty storefront with more space; the landlord wanted to charge the former merchant double when his lease expired. Greed is good. Good for nothing. Lost City Asks "Who Goes to Sevilla?" It is hard to believe that I have lived in New York for 21 years and never dined at Sevilla. Certainly, I've passed the classically quaint, and ideally situated, Village restaurant easily 1,000 times. This week I rectified the situation with an Eater "Who Goes There?" column. I'm still a-gog over the ancient wall murals in the back of the restaurant. They should be in a museum. How is it that the interior of this restaurant hasn't been landmarked? Here we are, in sunny Spain once again. Seriously, what is it with Spain and survival in this town? The Italians may have everyone beat when it comes to sheer numbers of New York restaurants. But when you step down to the level of anonymous, dust-gathering, timecard-punching joints, the Spanish give everyone a run for their money. Two weeks ago, I found myself at Spanish Taverna, the Cantina That Midtown Forgot. Now, here I am at the West Village’s Sevilla Restaurant for another heaping helping of sangria and the inevitable paella. The restaurant has been run by a series of Spanish families since its founding, and has been under the command of Jose Lloves since the early ‘70s. Silver-haired Lloves, in suit and tie, still greets each incoming guest with a somber, slightly weary courtesy. These included plenty of loyal regulars and just as many tourists. Sevilla apparently feeds off both worlds. Several parties were evident first-timers, gawking at the surrounding, including a foursome of Japanese visitors. Others slapped Lloves on the back and sailed on to a familiar booth in the rear where loved ones awaited. Said one WASPy character in a yellow Tommy Hilfiger windbreaker upon entering, “Two of my daughters are back there.” A gay couple next to me spent half the meal talking in English and then, without apparent reason, communicated solely in Spanish for the remainder of the evening. With Spanish restaurants of a certain age, paella is always the first item on the menu and the thing recommended by every waiter. I acquiesced and for once wasn’t disappointed. The rice was fresher than usual, the seafood not as rubbery. It was preceded by a decent iceberg salad held in place by a thick, pale wheel of tomato. I was still more impressed by the house sangria, a drink that typically depresses me as a wan, washed-out punch. But this spicy, lively potion had a revitalizing punch. It’s whipped up by Sevilla’s bartender of 25 years, Roberto. Lloves—whose hair didn’t go gray worrying out payments to pesky landlords; he owns the building—imparted the heart of its secret: “Brandy, prosecco and GOOD red wine.” By my taste buds, plenty of brandy. More beguilingly skewed facades from Restless. Forgotten New York visits Ditmars Boulevard. The Berghoff Memorial Blog, honoring the bygone Chicago landmark restaurant, is gone, and I am sad. One of the things I like most about going to Brooklyn Cyclones games in Coney Island—aside from being able to get Magic Hat beer, kosher hot dogs and knishes, Nathan's french fries, the views of the water, the Wonder Wheel, the Cyclone and the Parachute Drop, the "Hot Dog Races," the breeze wafting in from New York Harbor, and, jeez, just about everything—are the ads that line the outfield. There are a few placards for national, corporate products like Pepsi and the execrable Applebee's. But mainly the ads are homely jobs for wonderful, local (or formerly local) concerns like Maimonides Medical Center, Carvel Ice Cream, the Brooklyn Window & Door Corporation, the NYC Union of Carpenters and Contractors and the good old Wonder Wheel. But my favorite of all the ads is the one for Gold's Horseradish out in far right field. I don't know. Something about their line of tear-provoking products just says "New York." Anyway, you can bet you're not going to see a Gold's billboard at some stadium in Sarasota or Durham. That reason? Because he's the only person in the city powerfully positioned enough to screw up the Bloomberg administration's ruinous rethinking of Coney Island. Despite widespread, and unrelenting criticism (including protests from documentary filmmaker Ric Burns and Pulitzer Prize-winning historians Edwin Burrows and Mike Wallace (“Gotham”)) of it's awful rezoning scheme for the treasured Brooklyn neighborhood (More towers! Less amusement! ), the City has steamrolled forward in typically arrogant, Bush-style, the-public-be-damned style with its plan. Yesterday, the City Council's land-use committee approved the city's controversial rezoning, meaning it is likely on track for full Council approval on July 29 (because when lately has the Council stood up to Bloomberg?). According to City Room, "City officials and Councilman Domenic M. Recchia Jr. also hinted that the city may expand the amount of land dedicated to amusements between Surf Avenue and the boardwalk, as many critics have sought. But that will only happen if the Bloomberg administration comes to terms with the developer Joe Sitt before the full council votes on the redevelopment plan on July 29." That's a big "but." 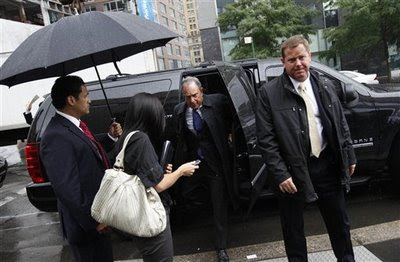 Sitt, long a thorn in the side of both the public and Bloomberg, say thanks, but no thanks, to the City’s offer to buy his property for $105 million. He wants more dough than that. Sitt's bad for New York. But Bloomberg's worse. And, unbelievably, in this dog fight, I'm rooting for Sitt. No one, not even that prevaricating skunk, shouldn't be threatened with having his land taken away via Eminent Domain, as the Bloomberg goons have done. Perhaps if he stands his ground long enough (and it's hard to make a mega-developer budge when it comes to money), he's scuttle the City's Coney plan, or at least force them to revise it. I mean, who the hell proposed erecting a high-rise hotel in front of the historic Wonder Wheel and thinks it's a good idea? The kind of person that should be stopped, that's who. There once was a nice, little, Southern-styled restaurant called the Brothers Bar-B-Cue at 228 W. Houston Street. It was a homey, honky-tonk place. They served decent ribs and gave you a free basket of hush puppies to snack on when you sat down. And the space was curious, a crooked building with an entrance on both Houston and in the back on Downing Street. It made for a nice before-or-after place to grab a bite after a movie at Film Forum across the street. And then it closed down. Brothers Bar-B-Q moved to a bigger space across Varick. Eventually, that closed as well. The old space stood derelict for months. Then years. The old signage remained. The windows grew dirty, the facade forlorn. Nothing happened. Then, recently, things got so bad that they just boarded up all the windows and doors on both the Houston and Downing sides. What's going on here? The building, which is not landmarked, dates at least back to the 1890s. There used to be factories in the upper floors. It appears to belong to one William Gottlieb. Back in February 2008 there was a complaint filed with the Department of Building that there was an "ILLEGAL CONVERSION COMMERCIAL BLDG/SPACE TO DWELLING UNITS" going on. The DOB took a look and found "WORK W/O PERMIT. WORK NOTED: AT 5TH FLOOR APT ERECTED FULL HEIGHT PARTITIONS. TO CREATE 4 CLASS 'B' APTS. WORK 100% COMPLETE. REMEDY: OBTAIN PERMITS OR RESTORE TO PRIOR LEGAL." CONDITIONS. Then I found this, which appeared to explain the mystery a bit. Gottlieb died back in 1999 and left behind him a tangled estate of dozens of buildings, mostly in Greenwich Village. Gottlieb was a strange man. A lengthy article in the Times said "Gottlieb was heavyset and invariably dressed in wrinkled pants and an old golf shirt, which some people suspected he seldom changed. He wore big, black-framed glasses and carried a pendulous chain of keys. During the 1970s, Gottlieb used to outfit his orange Volkswagen Thing with loudspeakers and drive it through the Village, blasting disco music. Later on, he trundled around in a green station wagon with a busted heater and a broken window, sometimes stopping to offer lifts to his tenants.... Bill Gottlieb never married or had children. Friends say the passion of his life was not money, but ownership. “He was a collector of buildings,” one associate says." Gottlieb learned the cardinal rule of his eccentric business style from none other than Harry Helmsley, for whom he worked early on as a leasing representative for a Helmsley-owned brokerage firm: "Never sell." Gottlieb got a lot of his properties on the cheap, when the City was going bankrupt in the 1960s and '70s. And he never sold. Neither have his heirs. He died suddenly, and, soon after, his family started bickering over the estate. Inheritance taxes were a big problem. "Ultimately, the family was able to work out a settlement with the I.R.S. over the estate-tax bill. The assessment, which stood at $50 million in 2004, is being paid in installments over 15 years." Could this be why 228 W. Houston stands idle? All I know is, last night, the lights on the upper floors were on. Varick Eatery. Don't know when this Village entity came along, but: like the stark, red-brick look; like the punchy name. Like it! I use the word "eatery" all the time in posts. This is the first time I've ever seen a business refer to itself by that slangy name, though. Absolutely nothing. Unless you count the odd bit of netting which is now draped like a canopy over the long-suffering construction site of the all-but-dead-and-buried former speakeasy. Otherwise, progress on the rebuild is at the same standstill is was three months ago. There are also some gaps in the plywood now, so I was able to fetch the below shot of the inside. Whaaa? The Diplomat? What's that? The Diplomat used to be on the corner of 3rd Ave and Carroll Street. I used to live across the street from it. It was a very nice place in the 70s... The older Italian gents used to hang out there. I was a very young woman, and used to feel very safe in the neighborhood because they would watch out for me. Very touching. But, perhaps, just one side of the story. By some fluke, I recently came across an alternative history of the Diplomat—the full name of which was the Diplomat Social Club, on the internet. It was headquarters for the Colombo crime family when it was run by Carmine "The Snake" Persico. (That's him, up top.) Persico operated out of the club after he was let out of prison and assumed the throne. 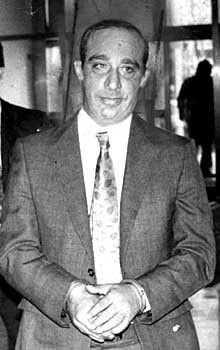 Also to be found there: "the main players of the Persico faction of the Colombo faction: Carmine, when he was out of prison, his brother Ally Boy, Jerry Langella, Hugh MacIntosh, one of the family’s main enforcers, Carmine Franzese, the brother of Sonny, Greg Scarpa, Anthony, Vincent and Joe, Jr., the sons of Joseph Colombo, anybody who was part of the Persico faction or who had dealings with them. I wonder what would have to happen for Bloomberg to get behind New York's small, independent businesses? As in the blight of unfinished and unoccupied condo complexes littering Bloomberg's New York in the wake of the Great Recession. And the building goes on! Writes Miss Heather, reacting to a NY1 story: "As if this was not depressing enough this tome goes on to say that despite this glut of over-priced King’s crap, the building continues. 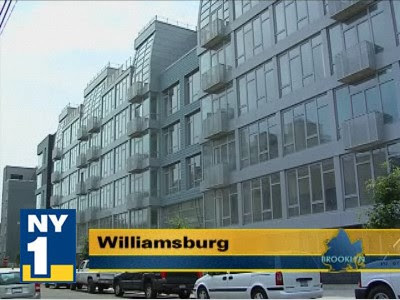 It is projected 5,200 more luxury apartments will find their way onto the market in 2010. Clearly the cardinal rule of how to get out of a hole (stop digging) has been lost on these people." 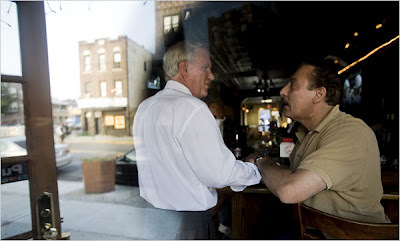 Tony Avella: Start using it. "Bloomblight." Work it into every speech and press release. As of July 19. Is the Coney Island summer to pass without this sacred pizzeria reopening? UPDATE: Slice has the new opening date as late August. There are a lot of bike riders in my building. Some keep their bikes inside, some (like me) lock them to the railing or lamppost and traffic signs outside. It's always been a safe neighborhood. Few worry. Lately, however, it's gotten very close just inside my front door. Everybody's brought their bikes inside. There are six or seven clogging up the ground-floor landing (including mine). Why? The word is out: there's a bike thief in the neighborhood. I have heard of at least three stolen bikes on my block alone, one belonging to my neighbor. And the rash of robberies is not limited to my immediate area; it appears to be Carroll Gardens-wide. I went to the venerable Bike Shop on lower Court Street. This trusted business has been in the area for a couple decades. The owners said they had heard tell of many stolen bikes of late. And not just fancy new mountain bikes, either. Also old used bikes that many have assumed immune to robbery, given their limited resale potential. We discussed possible culprits, and the Bike Shop owner made a suggestion that had never occurred to me: deliverymen. He said he'd noticed guys delivering food on bikes incongruously nice for their given duties. This seemed unlikely to me. Wouldn't people around the neighborhood notice them riding their stolen bike? The owner said bikes are easily disguised through paint jobs and such. Who knows? But one thing's for sure. No bike is safe in Carroll Gardens at present. Plaza Mexico, a taco joint just off the boardwalk in Coney Island. Fort Defiance, the new cafe-bar on Van Brunt in Red Hook, has been open for a few weeks. But now it has a nifty new hand-painted sign on the wall. Nice. Also, I'd be willing to wager that this is one of the few hipster bars in New York to have an American flag hanging outside its door. Hey, Mr. Monteleone. Where's Mr. Cammerari? What the F. Martinella Happened? Joe Jr. Before It Was Joe Jr.
Lost City Asks: Who Goes To Spanish Taverna? Last Meal at Joe Jr. 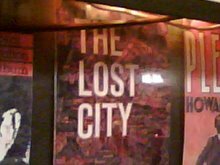 This Week on Lost City: Say It Ain't So, Joe! No, Wait: THIS Is the Quote of the Day! La Bonne Soupe to Open July 4! More Sadness from Joe Jr.